Georgia O'Keeffe (15 November 1887 – 6 March 1986) was an American modernist painter. 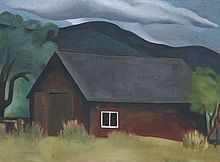 O'Keeffe has been a major figure in American art since the 1920s. She is chiefly known for paintings in which she synthesizes abstraction and representation in paintings of flowers, rocks, shells, animal bones and landscapes. Her paintings present crisply contoured forms that are replete with subtle tonal transitions of varying colors, and she often transformed her subject matter into powerful abstract images. O'Keeffe, 1916: 'Blue #1', watercolor and graphite on paper; - quote of Georgia O'Keeffe, 1916: 'Anita, I have just come to the comforting conclusion that I'll have to paint acres and acres of water color landscapes before I will look for even a passably fair one. Anita, I have just come the comforting conclusion that I'll have to paint acres and acres of water color landscapes before I will look for even a passably fair one. After about ten attempts — I certainly have to laugh at myself — It's like feeling around in the dark — thought I knew what I was going to try to do but I find I don't — and guess I'll only find out by slaving away at it. I feel — like a wreck — Have been working like mad all day — and you know how deliciously disgusted with every thing one can be — when the sun begins to go down — and one has been working ones head off all day. It gives me the sensation I used to have when I was a youngster and was going away from home on the train — It is a very special sort of sick feeling. Last night I couldn't sleep till after four in the morning – I had been out to the canyon all afternoon – till late at night – wonderful color – I wish I could tell you how big – and with the night the colors deeper and darker – cattle on the pastures in the bottom looked line little pinheads. I can understand Pa Dow painting his pretty colored canyons – it must have been a great temptation – no wonder he fell. Then the moon rose right up out of the ground after we got out on the plains again – battered a little where he bumped his head but enormous – There was no wind – it was just big and still – so very big and still – long legged jack rabbits hopping across in front of the light as we passed – A great place to see the night time because there is nothing else. – then I came home – not sleepy so I made a pattern of some flowers I had picked – They were like waterlilies – white ones – with the quality of smoothness gone. Anita – I am so glad I'm out here – I can't tell you how much I like it. I like the plains – and I like the work [her painting] – everything is so ridiculously new – and there is something about it that just makes you glad you're living here – You understand – there is nothing here – so maybe there is something wrong with me that I am liking it so much. Your letter became before I was up this morning – Yes nice to get. I recognize two of the drawings you speak of – Number one is the first of the dozen or more you speak of – number 2 came next The last – It didn't quite satisfy me so I tried again – the last one was so much worse than the one you like that I thought I had just about worn the idea out so quit.. .You ask me what I did with the rest of myself when I made number 2 -.. .I sat up almost all night one night this week and made the most infernally ugly little shape you ever saw – I wanted to break it when I got through – but didn't then next afternoon when I had time to look at it, it amused me so that I didn't – really its laughable – it's so ugly – and still some way it's quite beautiful – I don't know – I may break it up – or I may try to cast it just for fun – I have another idea that I'm in an awful stew to model – I am going to get a lot of patience so I can make all the little do-dangles I want to and won't have to break one up so I can make another – I want to make a big one.. The plains are very wonderful now – like green gold and yellow gold and red gold – in patches – and the distance blue and pink and lavender strips and spots – May sounds like a Dow Canyon but really its wonderful – specially in the evening – I usually go alone – Yesterday rode home on a hay wagon – no it was clover with a funny old man – His mules and wagon blocked my path so we started talking.. .We had a great time riding toward the sunset. He was little and dried up and weather beaten – but he likes living.. I have been thinking of what you say about form.. .I feel that a real living form is the natural result of the individual’s effort to create the living thing out of the adventure of his spirit into the unknown.. ..and from that experience comes the desire to make the unknown known. By unknown I mean the thing that means so much to the person that he want to put it down - clarify something he feels but does not clearly understand.. .Making the unknown known.. ..if you stop to think of form as form you are lost. I thought you could write something about me that men can't – What I want written – I do not know – I have no definite idea of what it should be. – but a woman who has lived many things and who sees lines and colors as an expression of living – might say something that a man can't – I feel there is something unexplored about woman that only a woman can explore – Men have done all they can do about it. Does that mean anything to you – or doesn't it? School and things that painters have taught me even keep me from painting as I want to. I decided I was a very stupid fool not to be at least paint as I wanted to and say what I wanted to when I painted as that seemed to be the only thing I could do that didn't concern anybody but myself.. .I found that I could say things with colour and shapes that I couldn't say in any other way things that I had no words for. I had wanted to talk with you about lots of things.. .I am anxious to get to work for the fall – it is always my best time I had one particular painting – that tree in Lawrence's front yard as you see it when you lie under it on the table – with stars – it looks as tho it is standing on its head – I wanted you to see it.. I am on the train going back to Stieglitz – and in a hurry to get there – I have had four months west and it seems to be all that I needed – It has been like the wind and the sun – there doesn't seem to have been a crack of the waking day or night that wasn’t full – I haven't gained an ounce in weight but I feel so alive that I am apt to crack at any moment.. I have frozen in the mountains in rain and in hail – and slept out under the stars – and cooked and burned on the desert so that riding through Kansas on the train when everyone is wilting about me seems nothing at all for heat – my nose has peeled and all my bones have been sore from riding – I drove with friends through Arizona – Utah – Colorado – New Mexico till the thought of a wheel under me makes me want to hold my head. I got a new Ford and learned to drive it – I even painted – and I laughed a great deal – I went every place that I had time for – and I am ready to go back East as long as I have to go sometime – If it were not for the Stieglitz [her husband then]] call I would probably never go – but that is strong – so I am on the way.. .I hope a little of it stays with me till I see you – It is my old way of life – you wouldn't like it – it would seem impossible to you as it does to Stieglitz, probably – but it is mine – and I like it – I would just go dead if I couldn't have it.. I know I cannot paint a flower. I can not paint the sun on the desert on a bright summer morning but maybe in terms of paint color I can convey to you my experience of the flower or the experience that makes the flower of significance to me at that particular time. Color is one of the great things in the world that makes life worth living to me and as I have come to think of painting it is my effort to create an equivalent with paint color for the world – life as I see it. The large 'White Flower' [Georgia painted in 1929] with the golden heart is something I have to say about White – quite different from what White has been meaning to me. Whether the flower or the color is the focus I do not know. I do know that the flower is painted large to convey to you my experience of the flower – and what is my experience of the flower if it is not color. Artists and religionists are never far apart, they go to the sources of revelation for what they choose to experience and what they report is the degree of their experiences. Intellect wishes to arrange — intuition wishes to accept. A flower is relatively small. Everyone has many associations with a flower - the idea of flowers. You put out your hand to touch the flower — lean forward to smell it — maybe touch it with your lips almost without thinking — or give it to someone to please them. Still — in a way — nobody sees a flower — really — it is so small — we haven't time — and to see takes time, like to have a friend takes time.. .So I said to myself — I'll paint what I see — what the flower is to me but I'll paint it big and they will be surprised into taking time to look at it — I will make even busy New-Yorkers take time to see what I see of flowers.. .Well — I made you take time to look at what I saw and when you took time to really notice my flower, you hung all your own associations with flowers on my flower and you write about my flower as if I think and see what you think and see of the flower — and I don't. So, probably.. ..when I started painting the pelvis bones I was most interested in the holes in the bones — what I saw through them - particularly the blue from holding them up in the sun against the sky as one is apt to do when one seems to have more sky than earth in one's world.. ..they were most beautiful against the Blue — that Blue that will always be there as it is now after all man's destruction is finished. Equal Rights and Responsibilities is a basic idea that would have very important psychological effects on women and men from the time they are born. It could very much change the girl child's idea of her place in the world.. .It seems to me very important to the idea of true democracy – to my country – and to the world eventually – that all men and women stand equal under the sky – I wish that you could be with us in this fight.. It seems odd to think of you at Lake George tonight – I can smell the outdoors – and hear it – and see the stars – So often before I went to bed at night I would walk out toward the barn and look at the sky in the open space. There was no light little house – there were no people – there was only the night – I will never go back again – maybe to stand just for a moment where I put the little bit that was left of Alfred [ Alfred Stieglitz, her husband] after he was cremated – but I think not even for that. I put him where he would hear the lake. – That is finished. ..About my work Howard – I always have two opinions – one is my way of seeing it for myself – and for myself I am never satisfied – never really – I almost always fail – always I think – now next time I can do it – Maybe that is part of what keeps one working – I can also look at myself – by that I mean my work from the point of view of the looking public – and that is the way I look at it when I think of showing. I have always first had a show for myself – and made up my mind – then after that it doesn't matter to me very much what anyone else say – good or bad. Dear Anita [ w:Anita Pollitzer ], don't forget w:Mary Cassatt [as one of her inspirations] — and I am not sure that your new paragraph will hold water [(Anita had sent her a chapter of the biography she was writing about Georgia] — We [artists] probably all derive from something — with some it is more obvious than with others — so much so that we can not escape a language of line that has been growing in meaning since the beginning of lines. Dear Anita, I read your manuscript some time ago and it has lain on my table — ..You have written your dream picture of me — and I am not that way at all. We are such different kinds of people that it reads as if we spoke different languages and didn't understand one another at all. You write of the legends others have made up about me — but when I read your manuscript, it seems as much a myth as all the others. I really believe that to call this my biography when it has so little to do with me is impossible — and I cannot have my name exploited to further it. I do not like the idea of happiness — it is too momentary — I would say that I was always busy and interested in something — interest has more meaning to me than the idea of happiness. I hate flowers — I paint them because they're cheaper than models and they don't move! The meaning of a word — to me — is not as exact as the meaning of a colour. Colours and shapes make a more definite statement than words. I write this  because such odd things have been done about me with words. I have often been told what to paint … I make this effort because no one else can know how my paintings happen. I don't really know where I got my artists idea. The scraps of what I remember do not explain to me where it came from. I only know that by this time [her eight grade's year] it was definitely settled in my mind. On the way I stood a moment looking out across the marshes with tall cattails, a patch of water, more marsh, then the woods with a few birch trees shining white at the edge on beyond. In the darkness it all looked just like I felt. Wet and swampy and gloomy, very gloomy. In the morning I painted it. My memory of it is that it was probably my best painting that summer..
Those perilous climbings [with her sister Claudia, in the Palo Duro Canyon, 1916] were frightening, but it was wonderful to me and not like anything I had known before. The fright of the day was still with me in the night and I would often dream that the foot of my bed rose straight up into the air — then just as it was to fall I would wake up. Many drawings came from days like that, and later some oil paintings. Bement [her art teacher] told me things to read. He told me of exhibitions to go and see [c. 1917].. ..the two books that he told me to get were Jeromy Eddy 'Cubists and Post-impressionism' and Kandinsky 'On the Spiritual of Art'... It was some time before I really begun to use the ideas. I didn't start at until I was down in Carolina — alone — thinking things out for myself. Later I had two green ones [alligator pears] — not so perfect. I painted them several times [c. 1920] when the men [American modernist artists, a.o. Marsden Hartley ] didn't think much of what I was doing. They were all discussing Paul Cézanne, with long involved remarks about the 'plastic quality' of his form and colour. I was an outsider. My colour and form were not acceptable. It had nothing to do with Cézanne or anything else. I didn't understand what they were talking about why one colour was better than another.. .Years later when I finally got to Cézanne's Mont Sainte-Victoire in the south of France, I remember sitting there thinking, 'How could they attach all those analytical remarks to anything he did with that mountain?' All those entire words piled on top of that poor little mountain seemed too much. The clean clear colours [of a Shanty farm] were in my head. But one day as I looked at the brown burned wood of the Shanty, I thought 'I can paint one of those dismal-coloured paintings like the men. I think just for fun I will try — all low-toned and dreary with the tree besides the door.' In my next show [c. 1923], 'The Shanty' went up. The men seemed to approve of it. They seemed to think that maybe I was beginning to paint.. ..that was my only low-toned dismal-coloured painting. I painted 'the Shelton with Sunspots' [New York], in 1926. I went out one morning to look at it before I started to work and there was the optical illusion of a bite out of one side of the tower made by the sun, with sunspots against the building and against the sky. I made that painting beginning at the upper left and went off at the lower right without going back. I find that I have painted my life, things happening in my life — without knowing. After painting the Shell and shingle [c, 1926] many times, I did a misty landscape of the mountain across the lake, and the mountain became the shape of the shingle — the mountain I saw out my window, the shingle on the table in my room. I did not notice that they were alike for a long time after they were painted. After I had been in Canada painting the wide white barns along the Saint Lawrence river, I thought how different the life of the Canadian farmer was from life in Cebolla. So I painted [in 1945] the Cebolla church which is so typical of that difficult life. I have always thought it one of my very good paintings, though its message is not as pleasant as many of the others. There are people who have made me see shapes — and others I thought of a great deal, even people I have loved, who make me see nothing. I have painted portraits that to me are almost photographic. I remember hesitating to show the paintings, they looked so real to me. But they have passed into the world as abstractions - no one seeing what they are. I don't remember where I picked up the head — or the hollyhock. Flowers were planted among the vegetables in the garden between the house and the hills and I probably picked the hollyhock one day as I walked past. My paintings sometimes grow by pieces from what is around.. .I have used these things to say what is to me the wideness and wonder of the world as I live in it. It is surprising to me to see how many people separate the objective from the abstract. Objective painting is not good painting unless it is good in the abstract sense. A hill or tree cannot make a good painting just because it is a hill or a tree. It is lines and colours put together so that they say something. For me that is the very basis of painting. The abstraction is often the most definite form for the intangible thing in myself that I can only clarify in paint. … I found I could say things with color and shapes that I couldn't say any other way — things I had no words for. And that - that's death riding high in the sky. All these things have death in them.. ('Ever since the middle Twenties', I said') ..Exactly, ever since I realized O'Keeffe couldn't stay with me. In comparing a natural black iris to the O'Keeffe painting titled 'Black Iris', there is no denying the edge of realism, but there is also no denying the lack of detail. Her paint brush blatantly neglected to add the feathery golden pollen of an iris's stigma as well as the wrinkled texture of the iris's velvet-like petals. Instead, she created softness in the petals that resembles human flesh, and tinted it in pale, pinkish tones rather than the bluish, black hues of a black iris. 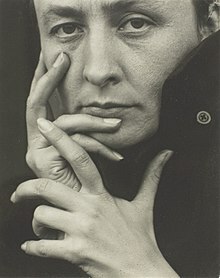 American Masters: Georgia O'Keeffe, at PBS. This page was last edited on 10 April 2019, at 18:55.